On Harvard’s campus last week, ralliers showed support for undocumented students. At colleges in Massachusetts and across the country, students are demanding that the schools protect their undocumented immigrant classmates if the incoming administration of Donald Trump moves to deport them. In a letter released Monday, more than 100 college and university presidents urged Trump and others to preserve and expand a four-year-old program, called Deferred Action for Childhood Arrivals, that protects undocumented immigrants. The presidents of Harvard, MIT, Tufts, Boston University, Northeastern, and Smith, Mount Holyoke, and Amherst colleges were among the signatories. The good news for undocumented students: Legal experts say it is highly unlikely the new president would dispatch federal agents to storm college dormitories and classrooms. The bad news is that even if campuses declare themselves “sanctuaries’’ and vow not to cooperate with immigration officials, undocumented students still could face a threat if Trump follows through on his campaign pledge to rescind DACA. Most colleges do not require students to be citizens to attend and many do not ask domestic students about their immigration status on applications. Ivy League colleges, in particular, have encouraged undocumented students to apply and offered them scholarships since they are ineligible for federal loans. After Trump’s victory earlier this month and in response to student outcry, schools have convened teams of lawyers, professors, and administrators to weigh possibilities and legal strategies to shield students. “People are taking [Trump] at his word and so preparing for the worst,” said Roberto Gonzales, an assistant professor at Harvard Graduate School of Education who specializes in the education of immigrants and Latino students. Even as Brown University’s president signed the petition in support of DACA, she was realistic with students last week in an op-ed she wrote in the student newspaper after more than 600 students turned out for a rally. “While we wish we could offer absolute protection to members of our community who are threatened by possible changes in policy, it would be irresponsible to promise protections that we cannot legally deliver,” Brown’s president, Christina Paxson, wrote. Still, it remains improbable that the authorities would target college students, said a Department of Homeland Security official. In 2010, undocumented Harvard student Eric Balderas was detained at a Texas airport, but officials with ICE ultimately decided not to deport him. ICE has not and does not conduct enforcement on campuses unless there is a serious and extraordinary circumstance involved, such as a threat to national security, the official added. MIT, Harvard, Boston University, Northeastern, Tufts, Yale, Dartmouth, Brown, and Middlebury College, in response to inquiries from the Globe, all said they are monitoring the incoming administration’s actions and want to protect their students. Even before Trump was elected, some colleges were providing special resources for undocumented students. The University of Connecticut in September added a tab on its admissions site specifically for undocumented students. In Connecticut, such students are eligible for in-state tuition. In May, University of California’s president, Janet Napolitano, announced a three-year plan, her second such effort, to support undocumented students with additional services and more money for student loans. The system’s chancellor last week said it will not cooperate with law enforcement to deport students. Tufts University in Medford convened a task force more than a year ago to weigh how to best meet the needs of undocumented students. 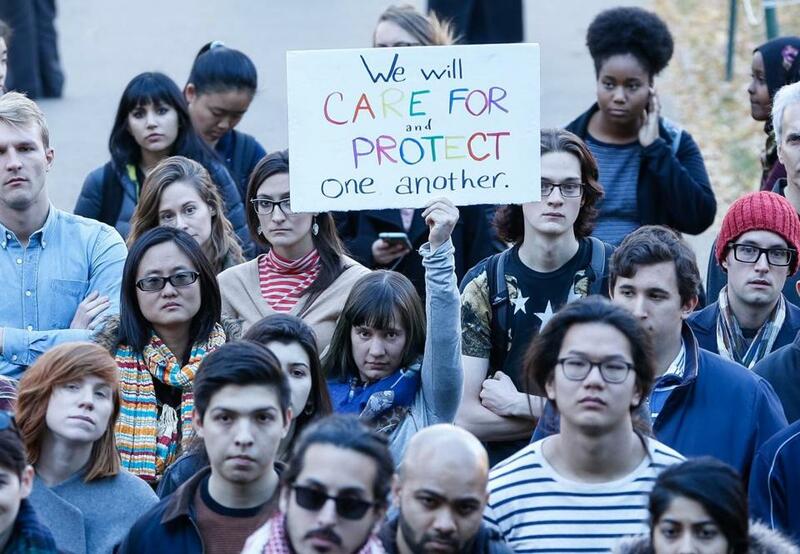 “We have a moral responsibility to protect the safety and well-being of all students regardless of their citizenship status or personal identities,” Tufts president Anthony Monaco told students at a rally last week. Harvard students delivered a petition to the university’s president, Drew Faust, last week asking for more campus resources for undocumented students, including a dedicated staff member. Elimination of DACA could have other wide-ranging consequences, said Susan Church, an immigration attorney in Boston, including making such students ineligible for certain types of financial aid and jobs. It would also cause a flurry of litigation on behalf of students, she said. “Politically it would be a disaster for [Trump] to start with this group of immigrants,” Church said. Whatever happens, this election is seared into the memory of many of those students, a stark reminder of their fragile status even on elite college campuses. Harvard freshman Rosa Vazquez said she couldn’t sleep on election night. “It was like the people that I had faith in, and this American dream that I loved with my whole heart and had pursued for so many years, telling me that I wasn’t worth it,” said Vazquez, who came to the United States from Mexico when she was 8 months old. After the election, Vazquez has focused her energy on advocating for Harvard’s undocumented students. Brown student Renata Mauriz, who came from Brazil when she was 12, helped organize the rally at the Providence school. Mauriz is unsure what it will mean to graduate undocumented into a world with Trump as president. These days, though, her future seems less important than that of her mother, an undocumented worker in New Jersey who she says endures long hours and low pay because she wants her two children to have a chance. “For me, having that diploma, it’s my duty for her,” Mauriz said.